Parties at the studio are very popular. There is plenty of space and we will help the children to get a great result so you can drink tea and relax. 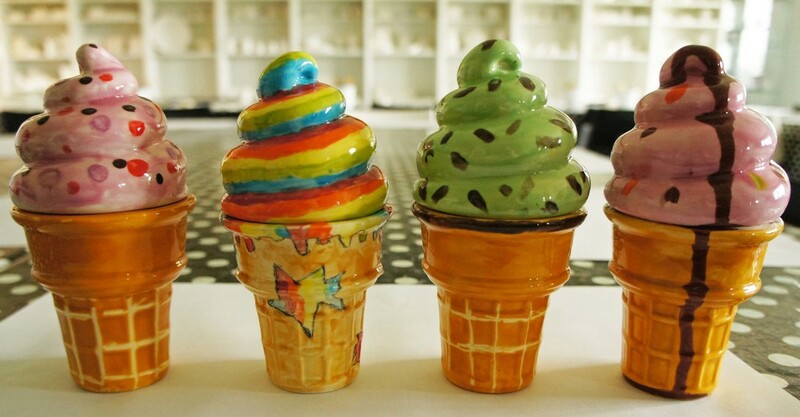 Ceramic painting is a great activity for all ages. The children paint their chosen piece in bright glazes and it is fired in our kiln and ready to collect one week later. You pay per person and choose which range the children can select from. The £12, £16, £18 range or free range meaning they can select anything they like. Each child designs their very own t-shirt which they can wear home at the end of the party. They design and paint it onto paper and we then print their design onto a white t-shirt. The colours are really bright and completely machine washable. If your child is really into a certain cartoon or band then you could theme the party around that. T-shirt designing costs £16 per child which includes the t-shirt. Bag desinging works in a very similar way to the t-shirts. Each child designs a picture and paints it onto paper which is then printed onto a shoulder bag. The bags are sealed with a zip and velcro front flap and the children can proudly model them home. Bag designing costs £18 per child which includes all materials. Paper bead jewellery making is a great activity for children aged 10+. Spend time chatting with friends whilst getting gluey making paper beads, to turn into colourful, contemporary bracelets. The minimum number for this activity is 8 and costs £18 per person. Learn how to create three pieces of enamel jewellery by fusing glass onto metal. Choose from a selection of metal shapes, add powder glass, glass beads, rods and sheets and see what exciting effects happen in the kiln. A great workshop for older children aged 12+ the minimum size for this activity is 6 children and costs £25 per person. To book a party please fill in the form below and we will get back to you very shortly with suggestions and availability or you can call us on 01622 735312. Please let us know the type of party you would be interested in having for your child, how old they are and the date you would like.